New dancers are very welcome! 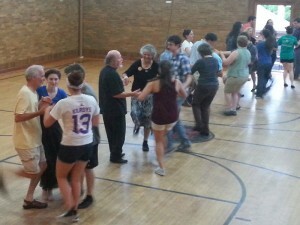 7:30-7:55 pm Beginner lesson – Before each evening of dancing, the caller teaches a free lesson to new comers. Attending this lesson the first time you contradance isn’t essential, but it can help new dancers understand the dances more easily. All dances are taught (so no worries about memorizing all the steps) but dances tend to get more challenging as the evening progresses, so coming early is encouraged. Part of the fun of contra dancing is that it is challenging and requires some learning. If you have experience with square dancing though, you’ll already be familiar with many of the dance calls used in contra dancing. Most new dancers find this takes several weeks of attending the dance, but once you know the calls, you’ve got it for good! New dancers do best when they seek out experienced dance partners while they are learning. And, experienced dancers are always encouraged to seek out partners who are new dancers. More detailed info in this wikipedia article. Here are two great videos made by Chattahoochee Country Dancers.